Alastair Cook achieved the landmark of 11,000 Test runs within 10 years and 290 days. He is the quickest and youngest batsman to reach the milestone. Alastair Cook, England's Test captain and prolific opener has played a pivotal role in mnaking England one of the formidable team in the Test arena. The southpaw’s run scoring ability and determination to excel in tough conditions has cemented his place as one of the all-time greats of English cricket. Although England lost the Test series against India 4-0, Cook became the first Englishman and the 10th overall to achieve the milestone of 11,000 Test runs in the Chennai Test. Cook started the tour brilliantly as he hit a century in the first Test at Rajkot but was unable to score freely in the rest of the Test matches. Along with Keaton Jennings, he provided a good start to the England 2nd innings in the fifth Test at Chennai. However, as Cook departed for 49, the English batting crumbled like a pack of cards. Cook has evolved as a modern era batting maestro scoring centuries against quality bowling attacks all over the globe. He has torn apart many great bowlers in his huge appetite for runs, amassing a staggering Test 30 centuries. 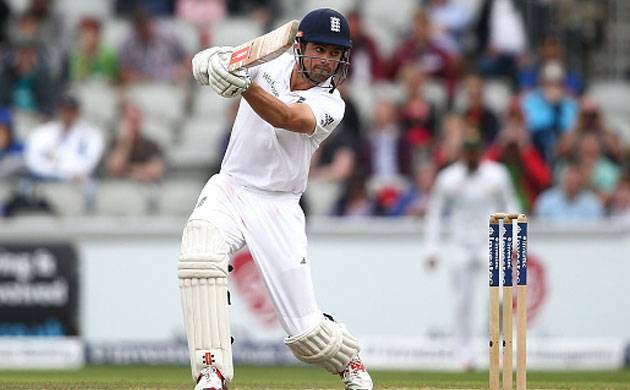 An impeccable opening batsman for England, Alastair Cook (11,057 runs) is still behind stalwarts such as Allan Border – Australia (11174 runs), Mahela Jayawardene – Sri Lanka (11814 runs), Shivnarine Chanderpaul – West Indies (11867 runs), Brian Lara – West Indies (11953 runs), Kumar Sangakkara – Sri Lanka (12400 runs), Rahul Dravid – India (13288 runs), Jacques Kallis – South Africa (13289 runs), Ricky Ponting – Australia (13378 runs) and Sachin Tendulkar – India (15921 runs).Cook, the highest run-getter for England, has surpassed greats like Graham Gooch, David Gower and Alec Stewart during his run making spree. Can Cook break 'Little Master' Sachin Tendulkar’s records for most Test runs ? The 31-year old batsman became the youngest player to join the 11,000 club in his 140th Test. He has also emerged as the biggest threat to legendary Indian batsman Sachin Tendulkar’s record of most runs (15,921) and centuries (51). Known for his meticulous style of play, Cook made his debut against India in 2006 and scored a century in his first match. Brought in as a replacement for Marcus Trescothick, he made a significant impact as he handled the Indian spinners with ease.Cook’s style of play is best suited to Test cricket and he holds records to his name. He became the youngest Englishman to score 2,000, 3,000, 4,000, 5,000 and 6,000 Test runs. Moreover, he also became the youngest player from any country to score 7,000, 8,000, 9,000, 10,000 and 11,000 runs in Test cricket. However, the crowning moment for the ace opener has been his splendid performance in the Ashes. The 2010-11 Ashes tour witnessed him scoring 766 runs in seven innings, helping England claim their first series win in Australia in 24 years. Cook's charismatic personality and ability to withstand pressure saw him succeed teammate and fellow opener Andrew Strauss as One Day international skipper in 2011 and as Test captain in 2012. As captain, he led England to a 3-0 Ashes win in 2013 and a 3-2 win in 2015. The year 2015 also saw him being named as captain of the ICC Test team of the year. His efforts as captain bore more fruit as he won 3-1 against India at home in 2014 and secured a 2-1 test series win in away Test series against South Africa.Cook’s One Day record has however not been as sensational as his Test record. He has scored only 5 centuries in 92 One dayers and been frequently dropped from the team. Despite leading England to the 2013 Champions Trophy final, he lost his place in the 2015 World Cup squad and One day captaincy due to poor form. The ICC has bestowed Cook with various awards to honour his stellar performances on the field. His never say die attitude also earned him the distinguished honor of ‘Commander of the Order of the British Empire (CBE)’ in 2016. Cook has done enough for England's cricket to establish himself as one of the greatest servants of the game and cricket lovers would love to see him set many more unbreakable records in future.